We’ve spent the last two days on the Isles of Scilly, a tiny archipelago of islands off the southwestern tip of England. The climate is famously mild but occasionally wild. This suits plants that like to bask frost-free in the sun, but which have tough hides when the salt laden winds blow in off the Atlantic. Succulents such as aloes, aeoniums, echeverias and sempervivums treat the Scillies as home from home. The hardiest have naturalised and can be found adorning walls and rocky banks with their fleshy rosettes. Some, like Aeonium cuneatum, even survive on the front line, just above the high tide mark. Echeveria lilacina is a little more choice. The silvery-lilac bloom on the leaves would be damaged by salt spray and windborne sand, but dazzles when planted outside in the Scillies provided the plants are found a sheltered, bone-dry spot. 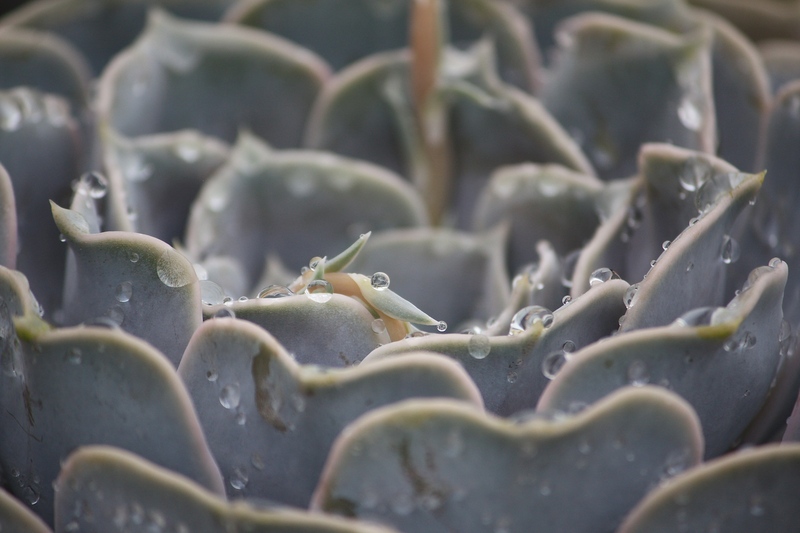 As if the leaves are not attractive enough, Echeveria lilacina also produces coral pink flowers in spring. The icing on the cake is a few drops of rain – all too plentiful, even in this island paradise. This lovely specimen was shown by Calamazag Nursery, based in East Taphouse, Liskeard, at the Cornwall Spring Flower Show last weekend.